Capitol View offers two valuable types of MasterCards. Our Classic MasterCard offers an attractive low interest rate, is straight forward, and easy to manage. Our Gold MasterCard offers our lowest rate plus cash back rewards, however it requires a minimum annual income. Use the chart below to determine which option is best for you! Setup free alerts for transactions that meet various conditions including card-not-present, large purchase amount, declined transactions, and international transactions. 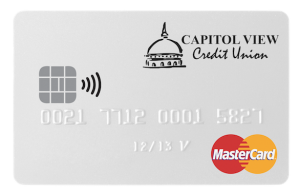 Click here to setup alerts for your Capitol View MasterCard. 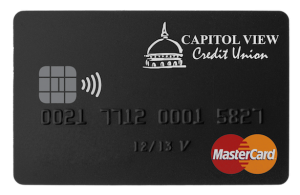 If you have a Capitol View MasterCard you can enroll to have a cash advance made to prevent your account from becoming overdrawn. Cash advance fees may apply. View our MasterCard terms & conditions, here. Home Banking Transfer Easily transfer funds in Home Banking to the MasterCard “Sweep” account. These payments are sent each business day to your MasterCard account. MyCard Info Tool Setup advanced payment options using the MyCard Info tool, which is accessible through Home Banking. Current cardholders may request a limit increase by completing this online form, here. Members will also need to attach or fax updated copies of pay-stubs for income verification. MyCard Info is Capitol View’s free online credit card management tool. Members can access it within Home Banking by selecting their credit card on the main balances page. With MyCard Info, members can view and download activity, recent statements, setup automatic payments, and notify us of upcoming travel (so our fraud monitoring system doesn’t block you). Click here for additional on all of our online and mobile tools. MasterPass (by MasterCard) offers cardholders a free way to more conveniently and more securely make purchases online. MasterPass allows you to load multiple debit/credit cards securely onto your profile and skip entering tedious fields during online purchases. Learn more about this great, free security feature at www.masterpass.com. 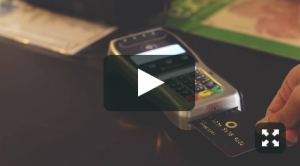 EMV ‘chip’ cards offer an embedded microchip, which offers powerful new security. This chip holds information that is encrypted, making it extremely difficult for the card to be copied or counterfeited. Rather than swiping your card, chip cards are inserted and held in a chip-enabled terminal to complete your transaction, this allows the terminal to communicate with the microchip. Capitol View’s MasterCards also offer touch-free technology. This is possible because of a hidden antenna which will allow for touch-free transactions at touch-free terminals. Touch-free transactions allow you to hold your card above the terminal sensor to complete the transaction. Touch-free technology is designed to add convenience by speeding up frequent, low-risk transactions. Annual Percentage Rate For Purchases, Balance Transfers, and Cash Advances (APR) 9.50% with Gold MasterCard when you open your account, based on your creditworthiness. After that, your APR will vary with the market based on the Prime Rate. 13.50% with Classic MasterCard when you open your account, based on your creditworthiness. After that, your APR will vary with the market based on the Prime Rate. How to Avoid Paying Interest on Purchases Your due date is as least 25 days after the close of each billing cycle. We will not charge you any interest on purchases if you pay your entire balance by the due date each month. The information about the costs of the card described above is accurate as of February 1, 2018.